Monster Munching: Chicken Karaage a la Chowhound! Elmo - Ain't Chicken Kaarage great! I've got my own recipe that I use. It's really great with a "cold one" or in your own personal bento!!! Kirk, I saw your recipe and was also thinking of trying it once I got Yukari's basic one down. Although, I did have to look up what togarashi was. Turns out I've been using it all along when I eat at Yoshinoya! I am SOOOO making this! That just looks so goooooood. You're giving Honda-Ya a run for its money. Now, all you need is a yakitori grill and you're in business. Can't wait to see how you like it! This one, I think, can be filed under "Completely Homemade with Daily G."
You know what's funny, I asked Chowhound about a year ago how to replicate their bacon wrapped asparagus yakitori, and they gave me some great tips on that as well. I tried it for the first time for a dinner party (which shows how confident I was of Chowhound's advice) and it came out great even on my gas grill! The only part that was lacking was the smoky taste that comes from that special wood they use. Maybe I should buy a yakitori grill?! Here's that thread on how to replicate Honda-Ya's bacon wrapped asparagus yakitori. Wholly agree...Popeye's rocks...well, okay most of them (I can vouch for all of them). One I tried in Detroit a few years ago simply was the best fried chicken I've ever had in my life. Never since has anything come close. Elmo, if you buy a yakitori grill I will be knocking on your door with a bag of skewers, cartilage and various cuts of meat. I loved the recipe and will try that out soon. LOL! Thanks Seth! That's a huge compliment. 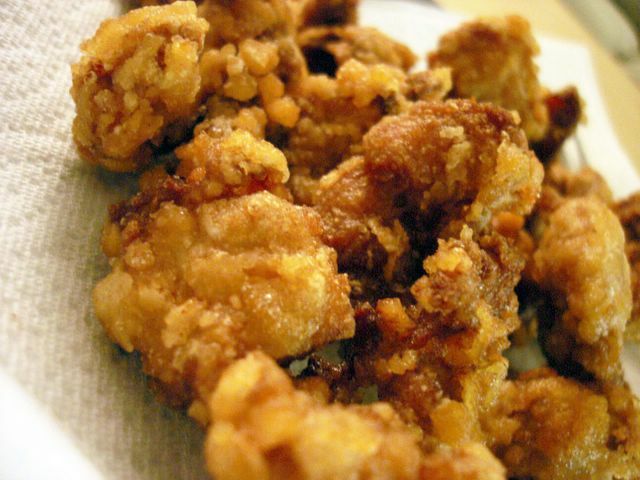 I don't know if it'll ever top your gram's karaage, but this one's pretty tasty! Elmo- I tried to look for Yukari's recipe on CHowhound but it was no longer there. Could you please post on your blog or e-mail to me? I updated the link. It should take you to Yukari's recipe now. Thanks for letting me know the link was broken.